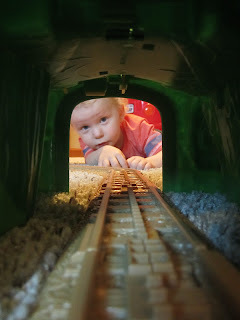 If you read this blog and don't know about Cael's train obsession, you must be as delusional as his locomotive-related fantasies. Cael has taken a simple interest and compounded it into an infatuation and now a full-blown lifestyle. It's hard to believe that two short years ago, trains weren't a daily part of our life and amounted to little more than background noise to the soundtrack of our day. From our front window, Cael would occasionally watch as the trains rattled by and "ooh" and "ahh" with each whistle. Then on Christmas Day, Cael received a plastic GeoTrax train set from Papa. He was hooked. Even that first day, he sat silently as the locomotive rolled over the tracks, shifting expressions only to giggle as momentum forced the train to speed down the hill. Two years later, trains have invaded our home and Christmas has only perpetuated the obsession. In addition to Cael's GeoTrax set, he has also received a Thomas the Train set, an electric self-adjusting engine and a wooden Brio train set inherited from Daddy's days as a young train 'ductor. 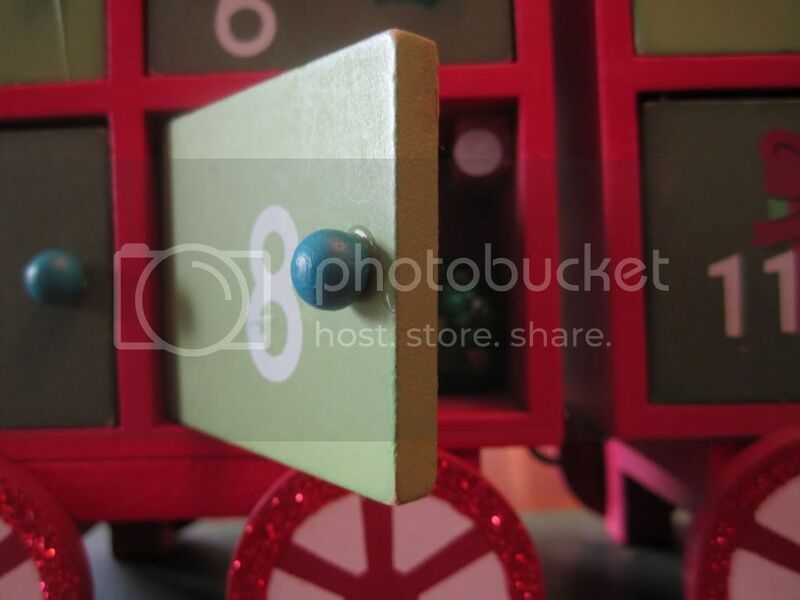 Papa, while walking through his church's bazaar, noticed a small, ceramic train decked out in greenery and red bows for the holidays. 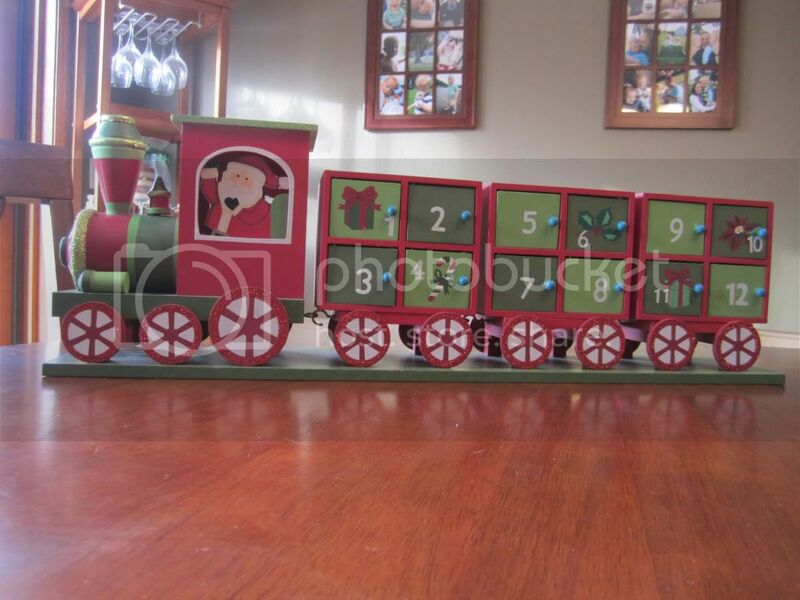 Knowing that this item fulfilled my borderline obsession with Christmas and Cael's over-the-line obsession with trains, he purchased it on the spot and it very quickly found a home. That didn't do it either. So when I was at Kohls and already on a mission to find an Advent calendar, a very expensive wooden Advent train caught my eye, and my breath. But at 40% off (is anything ever full-priced at Kohls?) and with Papa's 30% off coupon, it brought the item down into a "doable" price range so that it could grace our countertops and force my children to ration candy. There was still a void. As it turns out, that void was train-shaped. So the other night, after I was done wrapping Graham's Christmas tricycle into a really big box (yes, I did), Cael claimed one of the not-quite-big-enough boxes for his own. It had been flattened and he was disproportionately irritated by its inability to stay together. I taped it back into shape, cut out a hole for him to poke his head through, and in a moment of sheer genius, saw the train it could become and got to work. By yesterday morning, Cael was busy shouting commands at the other engineers and navigating the treacherous terrain of the living room from the safety of his steam engine. He loved it. Cael's newest aspiration-- his greatest wish-- is for the Polar Express train set to appear under the tree on Christmas morning. I've reminded him repeatedly that although Santa knows when he's sleeping, he does not have ESP and needs Cael to tell him exactly what gifts he wants. But since Cael can't exactly write a letter (or a number, really), I guess Joel and I will have to step up to the plate and make his little dreams come true. Maybe that will finally satisfy his need for trains. I'm not sure we'll ever be a train-free household. Even when I pack away the tracks, there is always another locomotive lurking around the corner where I least expect it. And while it is a small price to pay for the ear-to-ear grin on my son's face, I'm ready to move on to bigger and better interests. After all, life is hard enough without overcoming your reputation as a beady-eyed train enthusiast with frizzy hair and an affection for bathroom humor.